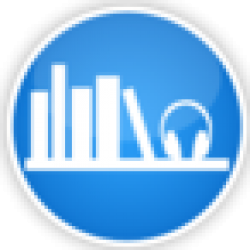 ABR's full Warstrider: Rebellion audiobook review and many others can be found at Audiobook Reviewer. It is assumed you have read/listened to Warstrider, the first book in this series and the comments here will not be spoilers. Rebellion is certainly book 2 of the Warstrider series, but it is also a distinctly different book. Much of the technology and weapons are described in detail in this volume. It is more introspective, more descriptive than the first volume. But certainly if you enjoyed the first book, you will enjoy this one too. Rebellion is about the struggle between the settled outer worlds and the repressive Japanese Imperium and its puppet hegemonic government. They have managed to keep mankind in peace for 5 centuries but at the cost of personal and planetary freedom. Dev Cameron is caught up in the fight, as a highly decorated soldier and later on the other side of the fight with his girlfriend (who has joined up with the rebels). There is quite a bit of political philosophy that some listeners will find very interesting and some quite uninteresting. The author doesn’t exactly embrace the libertarian ideals of the rebellion leader, but does outline its manifesto clearly and in depth. There is plenty of fighting using super high-tech futuristic weapons. Most of the scenes are well done and exciting. Unfortunately, Douglas insists on giving us acronyms and manufacturing names for these devices that the listener can’t possibly remember or keep straight. Futuristic model numbers for fictional machines might sound like it will give the story substance, but generally just registers as “bigger, stronger or better.” The pace in “Rebellion” is a bit slower, certainly not in a bad way, just that there is more description and back story to tell us how the future arrived at this state. It works as the listener is now invested in the story and can take a break from the action to find out why the world(s) is the way it is. David Drummond does a generally good job with the narration. Though it is distracting at times as some of the military recruits or younger soldiers whine and scream in fear more than one would expect from trained men, especially ones with neural implants designed to keep them calm. He has a sonorous voice that is wonderful to listen to, and these quirks are easily overlooked. Like the first volume, the second wraps up the story nicely and stands well on its own. It ends well, not with a cliffhanger, but a resolution that points to the next volume. 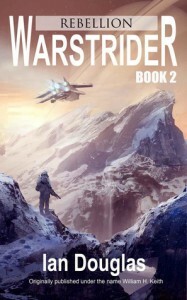 Clearly if you are in for one, you are in for the whole Warstrider series. Audiobook provided for review by the publisher.